X Marks The Blog Spot! As the CEO here at the Junior Explorer Club, I take my role as the Chief Exploration Officer to be more than just the owner. I have gained insider experiences throughout the many adventures here in Ohio and I have had the privilege to watch our explorers learn and grow from them as well. 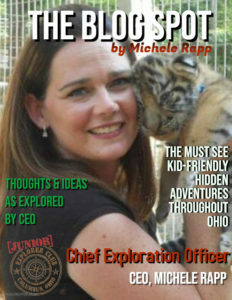 I am asked weekly about the best “go to” spots in Ohio or the “how to’s” when it comes to parenting or engaging the kids on adventures. Therefore, I welcome you to my BLOG SPOT about all things JEC, parenting, adventures and beyond. ENJOY! Is Kindergarten the right time to start swim lessons? Absolutely. When it comes to swimming readiness, earlier is better. 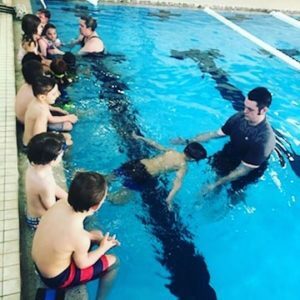 According to the Red Cross, if a child doesn’t learn how to swim by third grade, they’ll likely never learn, and the Red Cross promotes learning to swim early in life. The American Academy of Pediatrics recommends swim lessons for all children over the age of 4. We’ve all heard the scary stats and seen the unbelievable on TV. We must prepare our kids for water fun. 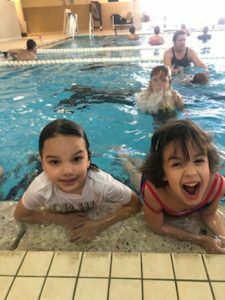 Kids who know how to swim are not only safer, they are happier because they can ably move about the pool as they please, meaning longer pool days, more exercise, and more fun with friends. Kids get swim lessons before the busy swim lesson season starts and classes fill up. Our parent members don’t have to find time to fit swim lessons, and transportation to and from, into already-busy schedules. Your kindergartner is learning to swim! Our youngest Explorers are feeling empowered, brave and pool-ready, and this will help keep them safe this summer. They’ll be ready for our active day camp! The lessons are during their day, when they aren’t at kindergarten. Our kindergartners are taught by Red Cross-certified instructors at Premier at Sawmill Athletic Club. The lessons are indoors and the weather is never an issue. The best childcare programs are the ones that focus on fun and enhancement and, most importantly, keeping our kids safe. There is no more important thing to learn for a child to stay safe than swimming. As parents, we are also navigating the waters when it comes to new topics regarding our kids. Read more about the 15 most common questions parents have about swim lessons. We love that our kindergartners are feeling confident in their swimming skills and are becoming so independent. Their new skills will help keep them safe this summer, at day camp and beyond. Here are some fun water games that will reinforce their skills and more reasons to start swim lessons. Imagine a day at the pool without the constant worry of scanning the horizon for your kid, being able to relax knowing they’re safe and having fun. Or, being at work while your kid is at the pool with day camp or friends and feeling confident that your kid has the skills to swim. From summer childcare to swimming lessons to unplugged fun and adventure, we’ve got you covered.